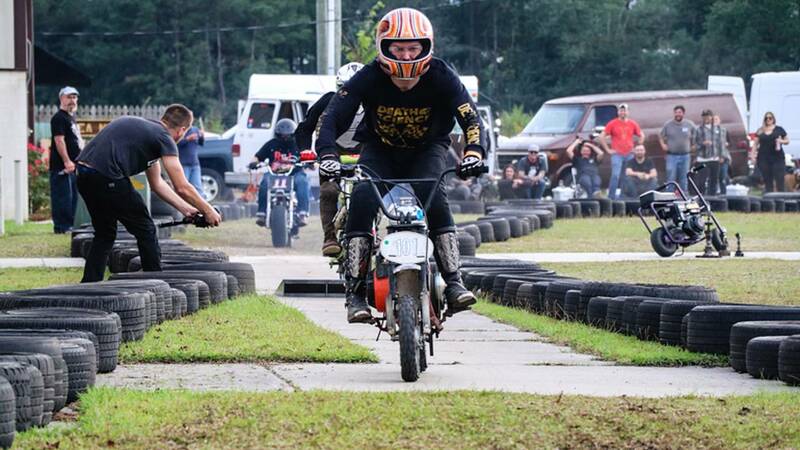 Choppers and mini-bikes descend on Eastern NC for a day of riding and racing. 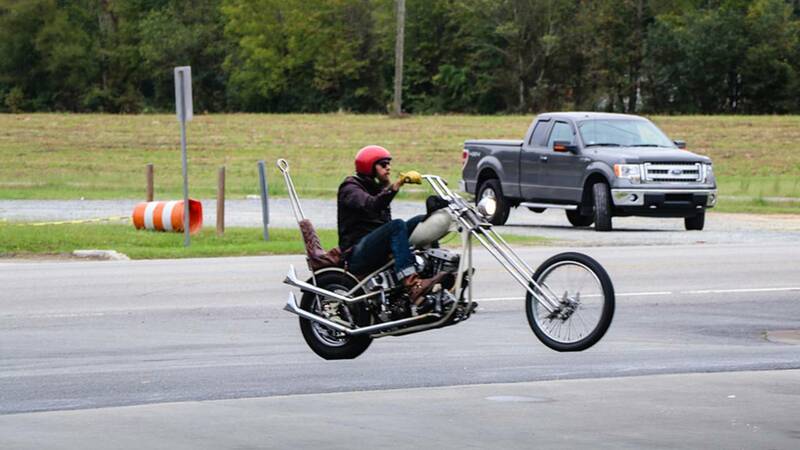 Choppers, battlefields, and mini-bikes. 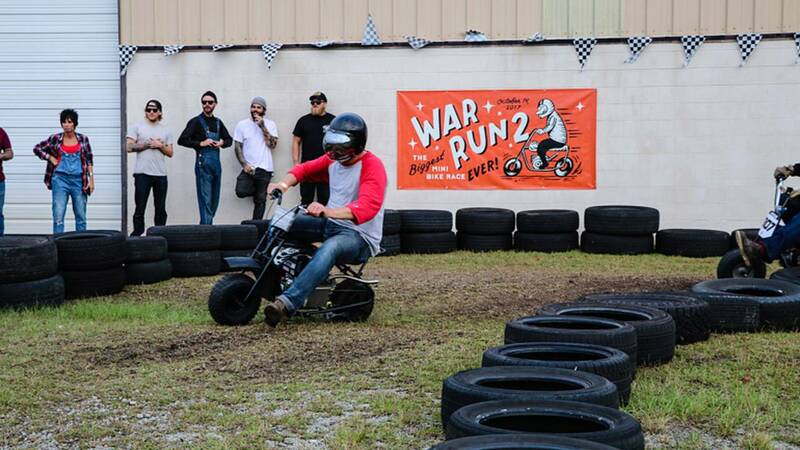 Normally these three things don't really go together, but when I was down in Eastern North Carolina for the second annual War Run, I got to find out just what a good combination they made. 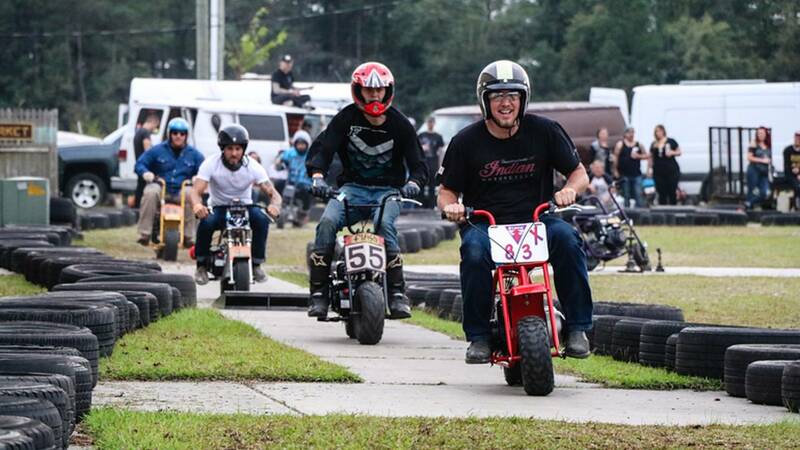 Event founder Scott Peck took your basic motorcycle run, added over 150 choppers, dropped in a tour of a Revolutionary War battlefield, and ended it with the "world's largest mini bike race ever". Then he filled in all the space in between with good food, live music, and great times. For a one day event, this one really packed it in. By the time I rolled home at 2 a.m., I was already thinking about going back next year. Some of you may recognize Peck as "Big Scott", co-host of the popular podcast Riders on the Norm. Besides being an avid chopper rider, he is also a 24-year veteran of the USMC, which is where he originally got the idea for the War Run. 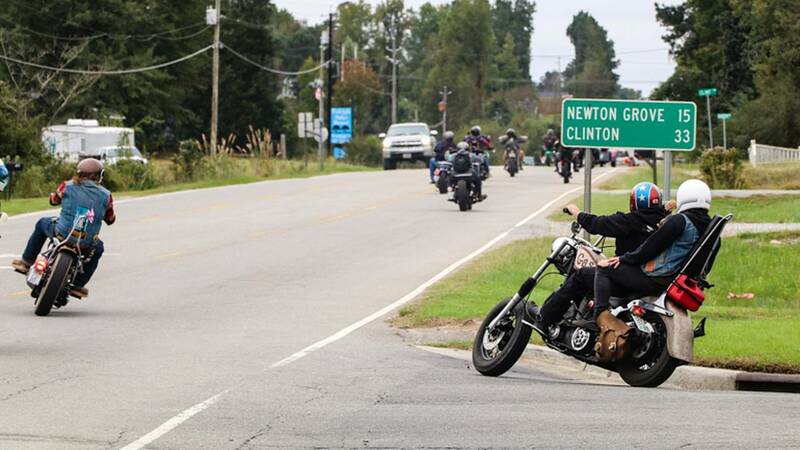 He wanted to put together an event that not only brought together friends and fellow riders, but also highlighted some of the extensive military history of North Carolina. As a way of giving back to the military community, he also donated all the money raised – over $2000 – to Building Homes for Heroes, a non-profit which helps wounded veterans from the wars in Iraq and Afghanistan. 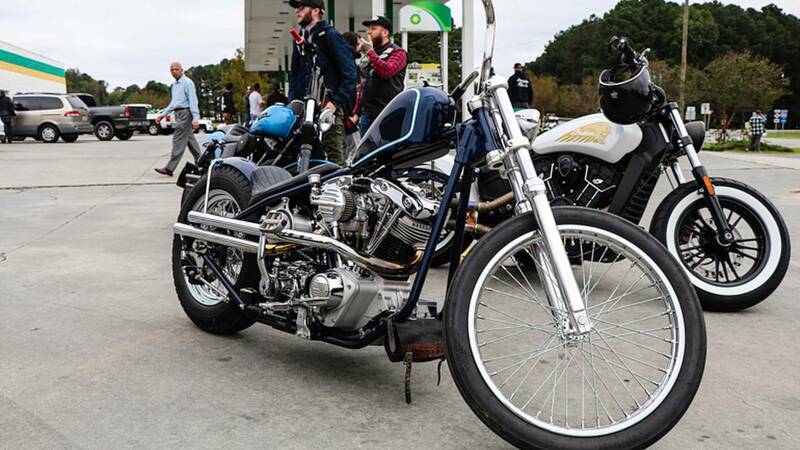 Shovelhead powered chopper parked next to a new Indian Scout. If you've read any of my previous articles, you probably already know that I don't ride a chopper. I do have a couple old Harleys however, so when I pulled into the parking lot at Ronnie's Country Store on my '64 Panhead I blended right in. As you might expect for a chopper run, the dominant motorcycle brand was Harley-Davidson, but there were a few Japanese motorcycles scattered around the parking lot too. The Dirty Rice Japanese chopper, surrounded by Harleys. For the next hour the parking lot slowly started to fill up with motorcycles as people pulled in either after a long morning ride or after waking up from a long night of partying. At around 10:00 a.m., Scott called everyone together for a quick safety meeting and a run down of our route for the day. 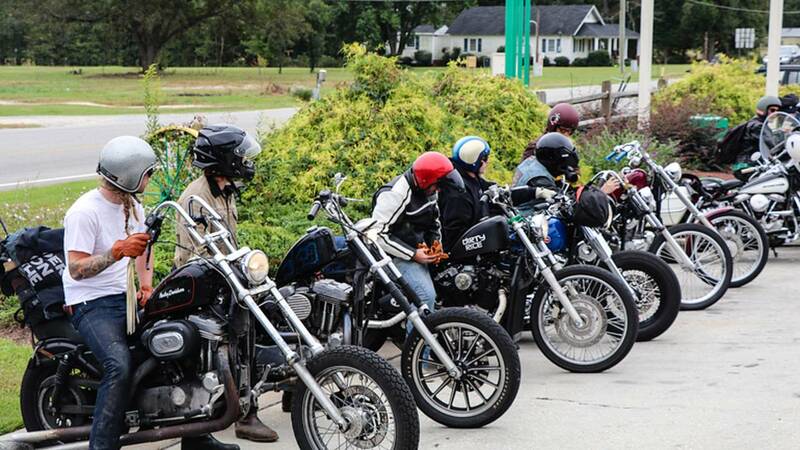 With so many motorcycles in attendance, the organizers decided that the best way to get everyone to the battle ground without crawling along at a snail's pace was to break up into smaller groups. Those groups would then leave at staggered times from the gas station. This worked out great and, with most groups stopping for gas (or chopper snacks) along the 80 mile ride east, we all managed to arrive at the battle ground around the same time two hours later. Rolling out for Moores Creek battle ground. The Moores Creek battleground was not exactly what I expected. Of course it had your standard memorial statues and informative signs, but unlike many of the battlegrounds I have visited, it was not made up of massive open fields. Instead, it was a series of small hills alongside a narrow wooded creek which had been the site of an early Revolutionary War battle back in February of 1776. In the brief morning encounter, the Patriots had claimed the high ground on one side of the creek. Knowing that the Loyalists – mostly Scottish Highlanders armed primarily with swords and only a few muskets between them – would need to cross the nearby bridge, the Patriots removed most of the timbers and coated the rest in lard. Once the Loyalists made it across the creek (with probably more than a few falling into the icy water) they were greeted by close to a thousand well-armed militiamen. Mistakenly, the Scottish commander ordered his Loyalist troops to draw broadswords and charge the enemy. This was perhaps the last broadsword charge in "modern" warfare as the American muskets made short work of the charging Scots. Guided tour of the Moores Creek battle ground. After finishing up the battleground tour and contemplating the bravery of the men on both sides of the creek, it was time to mount back up and ride the last 30 miles to Leland, NC. This time we elected to ride as a group, and with Scott in the lead we rolled out of the battle ground with a rumble that probably hasn't been heard along that creek since 1776. Loading up for the final leg of the run. Our final stop for the day was an industrial park which Scott has dubbed "the Compound". Once we pulled through the gate I could certainly see why. Metal warehouses dominated most of the space, but strategically tucked among them was a full-on race course. The entire course was bordered by tires to help keep the racers on track and to provide a little protection for the audience. The track traversed various types of terrain with quick transitions from grass and dirt to cement and heavy gravel. It also featured curves, changes in elevations, and a jump just to keep things interesting. The terrain quickly transitioned from grass to dirt to cement. 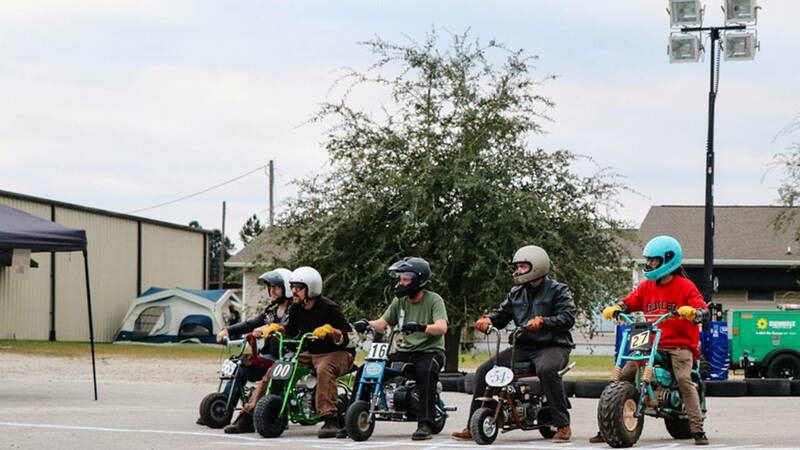 In all, 53 mini-bike racers showed up from 14 different states, some from as far away as Arizona. 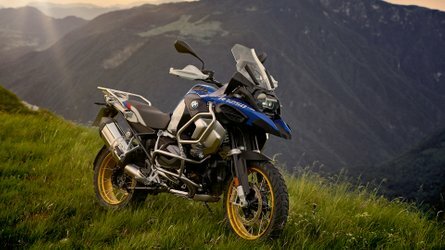 Not being a mini-bike aficionado myself, I had expected that everyone would pretty much be on the same style bike that I remembered my neighbor's kid riding back and forth across his front yard. 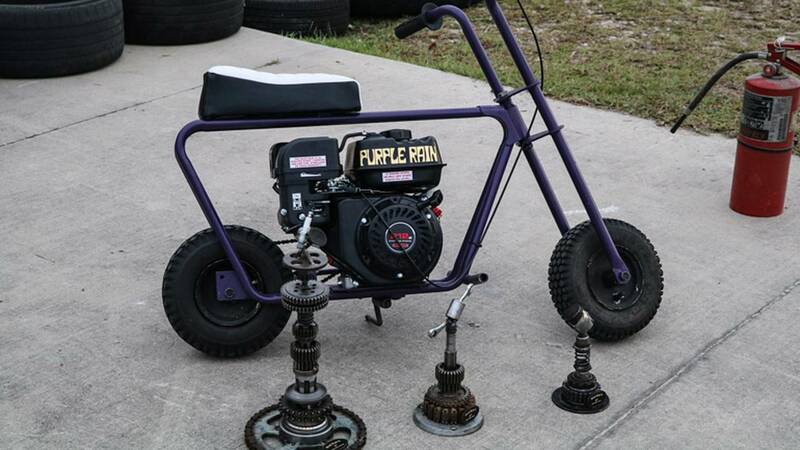 What showed up was a collection of small machines every bit as diverse as the full-grown motorcycles on the run. There were bikes of all sizes and colors, everything from ones that looked like they just got picked up from a yard sale to full-on custom painted race bikes. 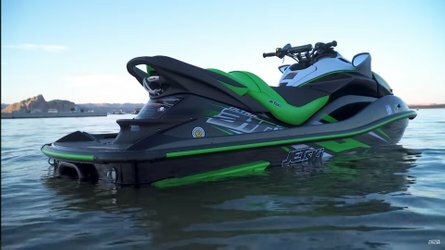 Basically, as long as it had a pull start motor and 12-inch or smaller tires, it was approved to race. 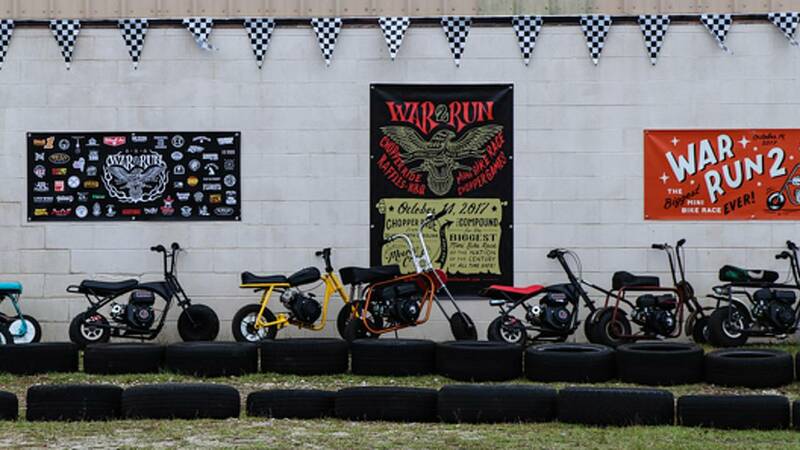 Every mini-bike was different, from the tires to the frames to the handlebars. The racers got the opportunity to warm up on the track while everyone else listed to live music and loaded up on Carolina BBQ brought in by a local caterer. Then, as the sun went down Scott announced the start of a massive raffle with prizes provided by the over 60 different event sponsors. Normally my extreme cheapness keeps me out of raffles, lotteries, and the like, but this time I decided I'd throw in $20 on a stack of tickets and see how my luck held out. I ended up being a three time winner, taking home a new helmet, HD skateboard deck, shirts, hats, stickers, etc, etc. Not a bad haul for a $20 investment. Still, even with those great prizes I was not the top winner. 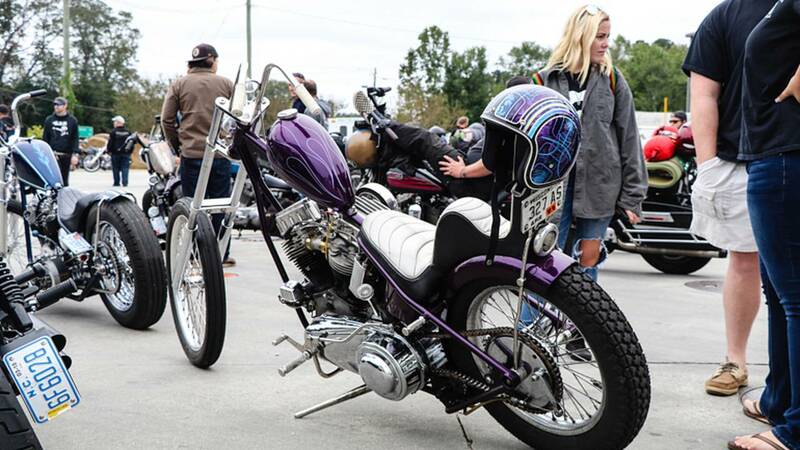 Other, luckier folks walked away with custom painted fuel tanks and helmets, signed artwork, and even an all purple mini-bike aptly named "Purple Rain". 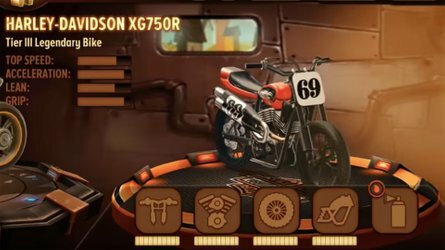 Custom trophies made by Ironworks Motorcycles out of Greensboro, NC. After dark, the generators cranked up and the light towers came on to reveal a track which was now surrounded with spectators. 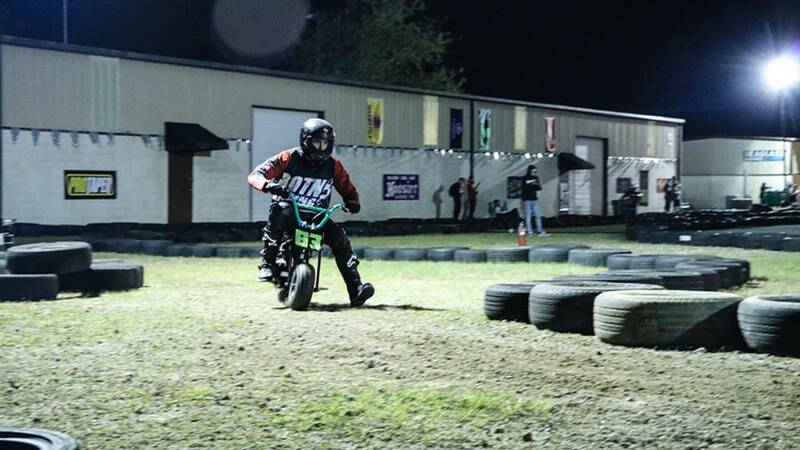 The first round of races consisted of five-lap heats with five racers per heat. 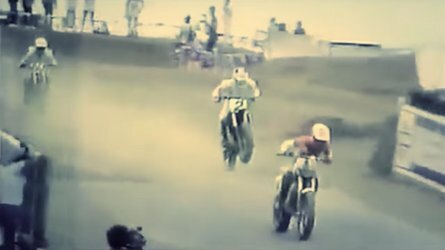 Just like they say, rubbing is racing and even with plenty of track space there were a few collisions between riders and even more contact with the tires bordering the track. 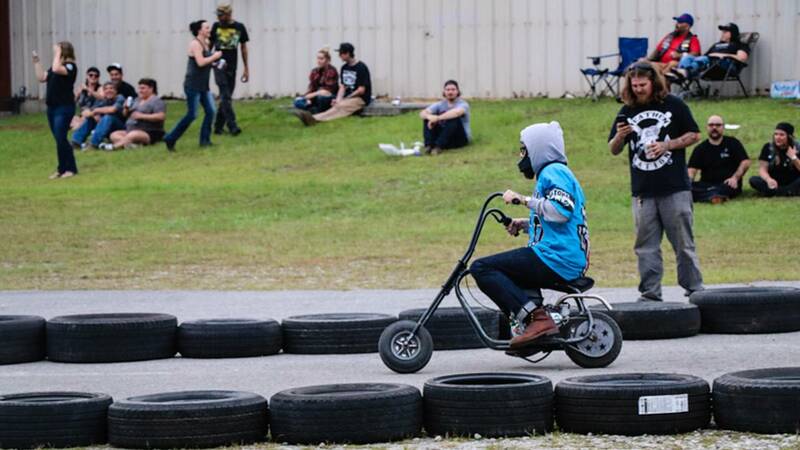 It quickly became obvious which riders had spent time testing and tweaking their rides and which had not, as a host of riders were forced out of the competition due to various breakdowns. As the racers ripped around the track, a live band was playing some serious heavy metal which gave the race a very surreal feeling. The final race was a 10-lap run with 10 riders, and these guys were serious about winning that $400 purse along with a trophy, custom painted helmet, and a chance to stand on the podium. Experienced X Gamer J.J. Flairty took the checkered flag in the end, and as fireworks were launched from the nearby rooftops, the crowd cheered and the champagne flowed. J.J. Flairty celebrates his victory with a little champagne. Once the race wrapped up, everyone pitched in to clear the hundreds of tires that outlined the track. Soon everyone started heading out and with a three hour ride home, I was ready to roll too. All told I think I spent about 18 hours, including travel time, at the War Run. Although I was pretty beat when I pulled up to my house, it was definitely worth it. I talked to Scott afterwards, and plans for next year's War Run are already well under way. 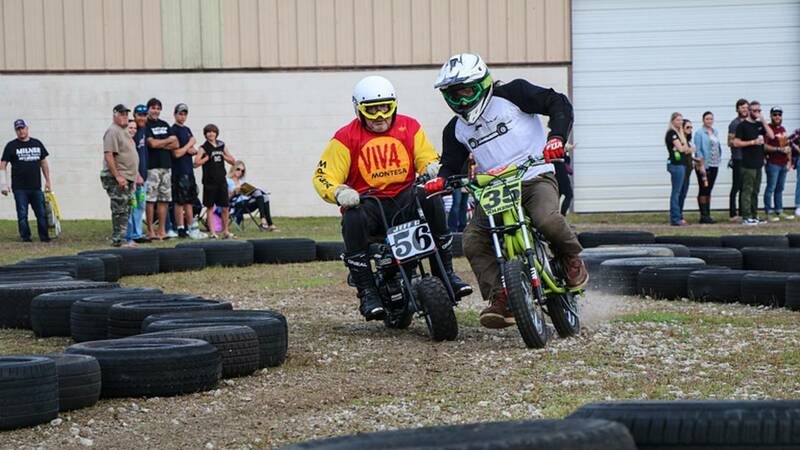 The date is set for October 13, 2018, and there are rumors that the race will be moving to a motocross-style track located just behind the compound. 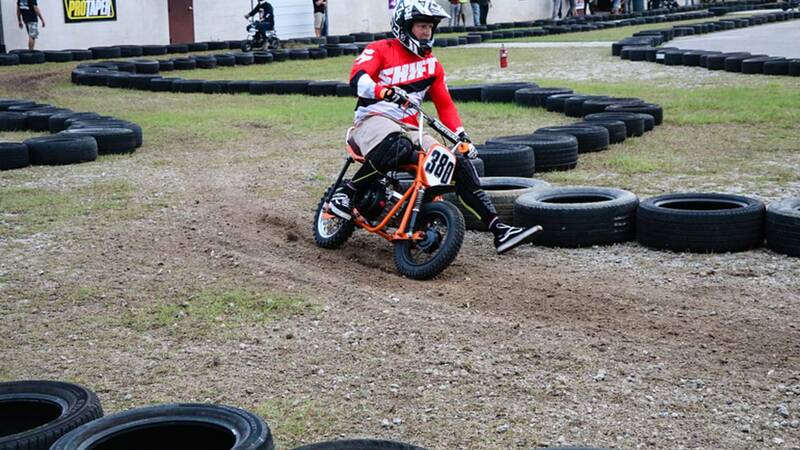 All I can say is that if there are going to be even bigger obstacles next year, everyone better start beefing up their mini-bikes now. Weak chains and bald tires are not even going to make it out of the gate next year. Give the War Run a follow on Instagram to keep up with the latest news for next years event. 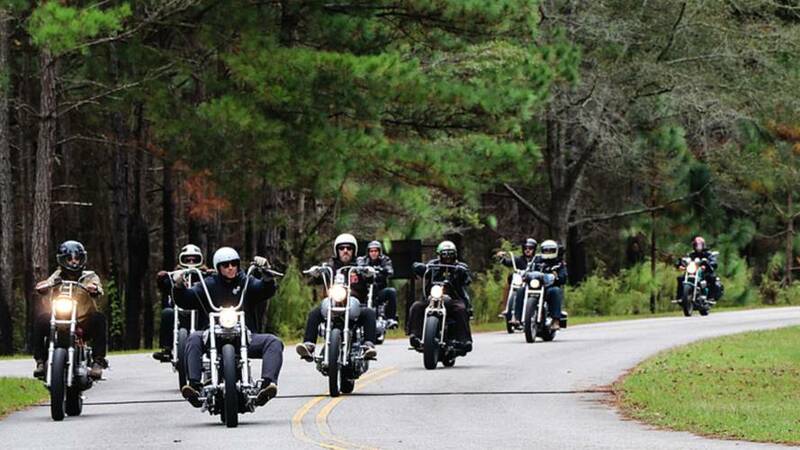 Even if you don't ride a chopper or a mini-bike you won't want to miss it. 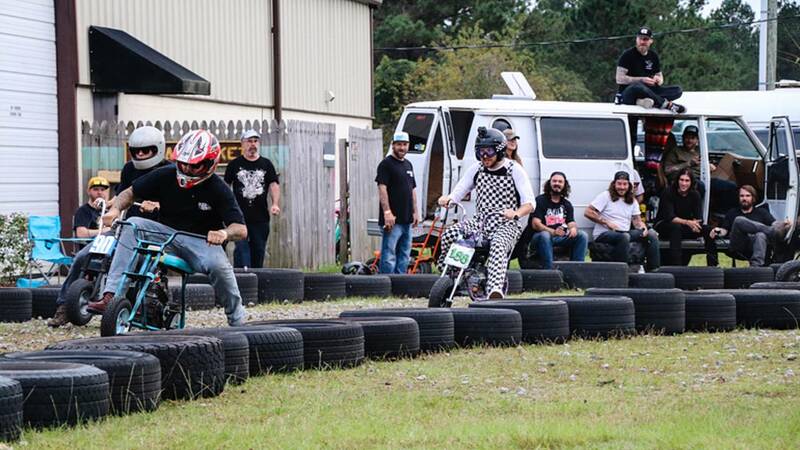 Do you have what it takes to tackle the biggest mini-bike race?